Run the solution. A new browser window/tab opens, as well as a console application. 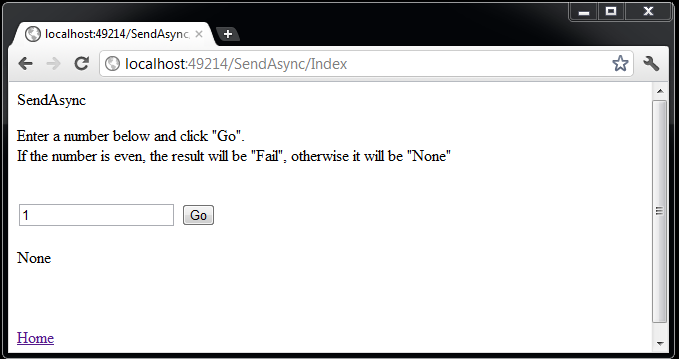 The sample covers only the sending of the asynchronous message as the send and block are similar in NServiceBus. In SendAndBlock, the web page renders synchronously. From the user's perspective, the interaction is synchronous and blocking, even though behind the scenes NServiceBus is messaging asynchronously. Changing the number in the text box from even to odd changes the result. // Register the MVC controllers. // Register the endpoint as a factory as the instance isn't created yet. For more details on how to inject NServiceBus classes into the controllers, check Sending from an ASP.NET MVC Controller. The controller is sending a message using the instance injected in controller's constructor (IBus implementation for NServiceBus version 5 and below, IEndpointInstance for version 6 and above). The code calls the send method, passing in the newly created command object. The call registers a callback method that will be called (with this parameter) as soon as a response is received by the server. This class implements the NServiceBus interface IHandleMessages<T> where T is the specific message type being handled; in this case, the Command message. NServiceBus manages the classes that implement this interface. When a message arrives in the input queue, it is deserialized, and then, based on its type, NServiceBus instantiates the relevant classes and calls their Handle method, passing in the message object. In the method body notice the response being returned to the originating endpoint. This will result in a message being added to the input queue for AsyncPagesMVC. Describes the various approaches to endpoint hosting. Guidelines for publishing messages from within web applications.